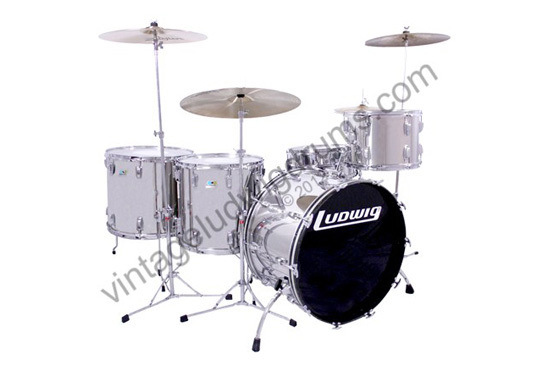 Check out our collection of Vintage Ludwig drum kits. Add one of these beauties to your collection today! 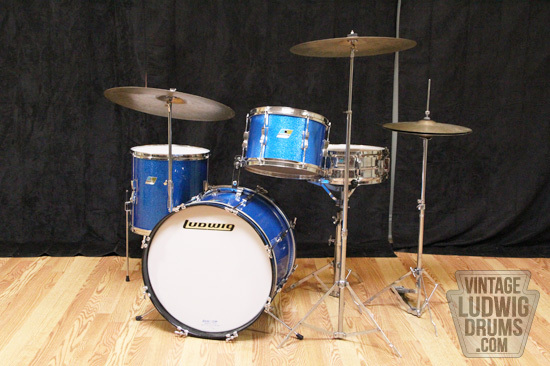 Original Ludwig Club Date kits feature the same 3-ply formula, and hardware quality of its "Pro Level" counterpart. These offer the classic Ludwig tone we've come to love, featuring hardware options that were designed for a more budget friendly price tag back in the day. These are easily some of the hippest kits to have. Club dates have an identity of its own, aesthetically speaking, while offering the quality and tone we demand as pro players. A much overlooked gem of a kit. It sports all original parts, and black oyster wrap. Kit is in excellent condition, with no aftermarket modifications. First year Ludwig Vistalite in the ever so thunderous Bonham sizes. 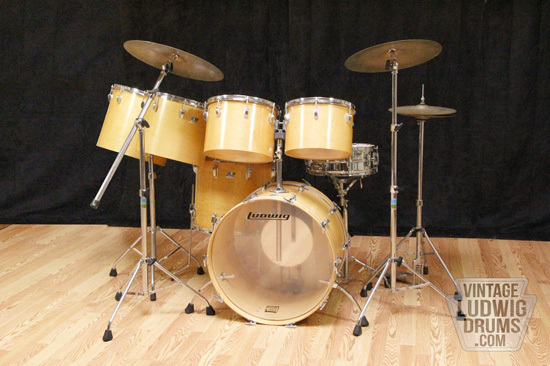 This kit was originally a double bass 26" played in a polka band! WILD! Kit is super minty, and clean. Very rare find in these sizes, and especially a virgin bass drum. Thinking vintage? Thinking Bonham? This is what ya need! 100% American made baby! This one gets all the looks, no doubt! Go drum fill crazy with this one! Near mint Quadra-Plus kit in its original factory form with original heads. Hard to find them this clean. Just the right kit to offer various setups, and tone. You won't go bored with this one. 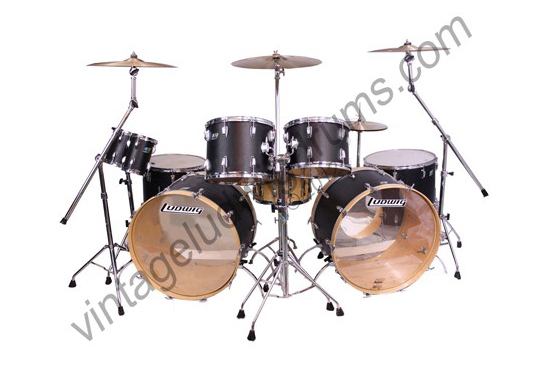 Probably the rarest of the rare Vistalite kit ever. First, It is a green Vistalite which was one of the first colors to be discontinued back in the 70's due to low sales. Word is that somewhere just over 50 were made. Now onto why this kit is even more rare! It is not a standard Vistalite cataloged configuration. 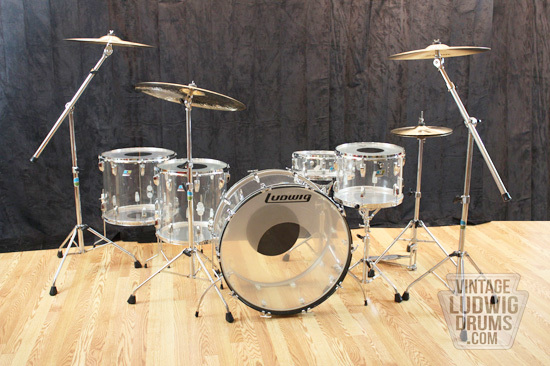 It is a customer ordered Super model with original factory ordered rail mount, cymbal mount, and double drum muffler on the tom tom and floor tom. You won't find another drum kit like this! Super clean and minty with absolutely no cracks! 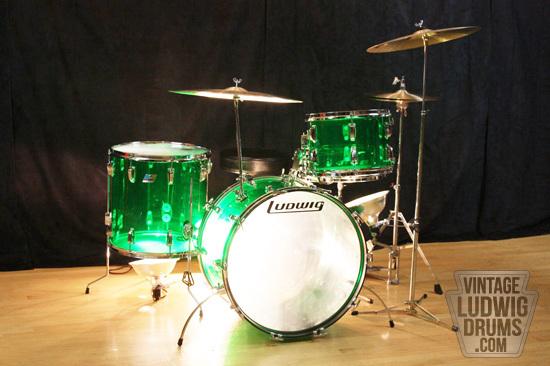 New Ludwig Vistalite kits run just around $3000, but ya won't find them in green, or with these custom options. 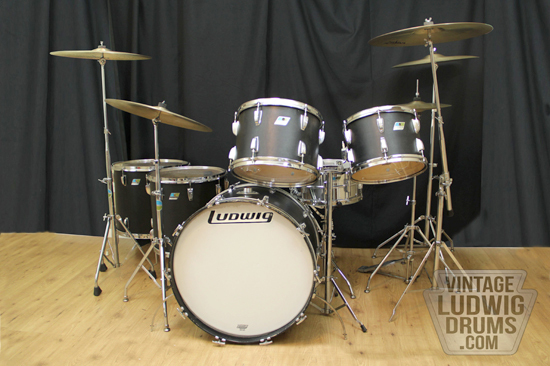 This stealthy looking vintage Ludwig kit sports a real unique wrap unlike any other material commonly used to wrap a drum. It features all original factory components free of any modifications. This configuration offers much versatility, and options at your disposal. Setup to the likings of a "Pro Beat" style, or strip it down to a "Super Classic" setup. Skies the limit! Much authority and presence, sure to bring the walls done with beefier 3-ply shells! 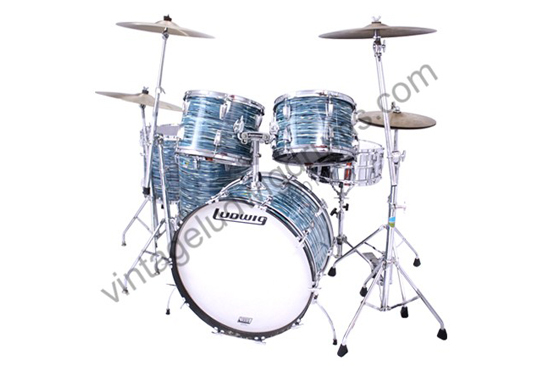 This kit features two mammoth clear interior virgin 3-ply shells with sequential serial numbers indicating a true original factory ordered Rock Duo set. These were signed and previously owned by Ludwig royalty Bun E. Carlos. It sports a very well preserved Psychedelic Red wrap with almost zero fade! 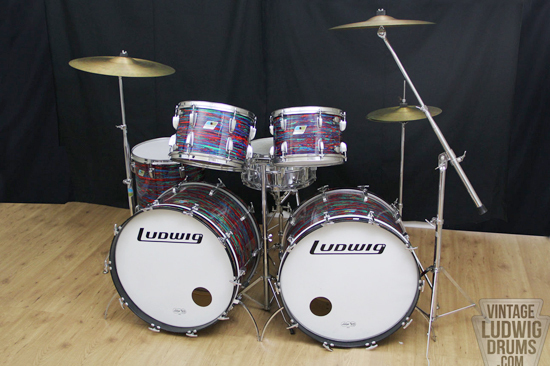 I'll give ya two reasons why this kit is crazy rare, and a must have for any Ludwig enthusiast! 1. ITS A ROCK DUO! 2. ITS PSYCHEDELIC RED, BABY!! Here is an excellent example of American innovation and quality. 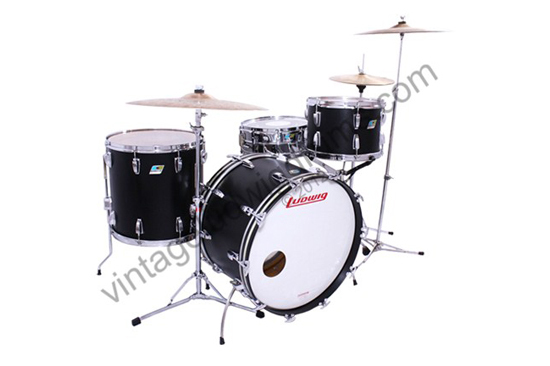 This kit sports all original factory components produced by Ludwig in their Chicago facility. Shells were produced by USA manufacture Cadillac Motors, while final assembly and cuts were done by Ludwig in Chicago. All shells are free of any cracks, or structural issues. Old Vistalite drums sure have a lot of vibe and character. 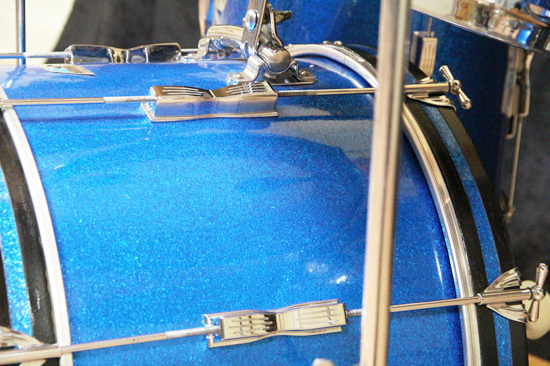 They were 100% made in the USA with quality parts, and components, not typical of any of today's drums off the shelf. The sound is very authoritative, and the look always attractive. Everyone needs a Vistalite in their collection! This a super clean drum set with original Black Panther wrap. It is pictured as a Super Classic setup. However, it includes a 9" X 12" Tom Tom. The bass drum is an original virgin kick, very few and far between. Shells have original factory date stickers. Versatility, with an array of sound the way you want it. This kit offers players exactly that. Configure it any way you want, and shape a sound as captivating as the look of this Blue Oyster Pearl wrap. Shells feature "granitone" interiors with wrap in second generation Blue Oyster Pearl wrap. 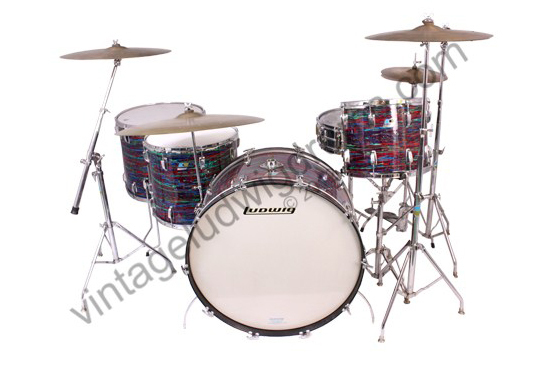 A real gem of a Vistalite kit in rare fashion. 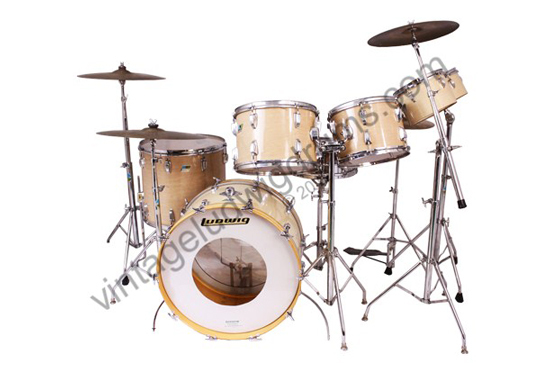 This kit is an original "Super" set-up with factory ordered rail mount, extremely rare for Vistalite drums. Shells were produced by USA manufacture Cadillac Motors, while final assembly and cuts were done by Ludwig in Chicago. All shells are free of any cracks, or structural issues. Old Vistalite drums sure have a lot of vibe and character. They were 100% made in the USA with quality parts, and components, not typical of any of today's drums off the shelf. The sound is very authoritative, and the look always attractive. Everyone needs a Vistalite in their collection! You'll have the wall come a crumblin' down with this roaring sound sensation. 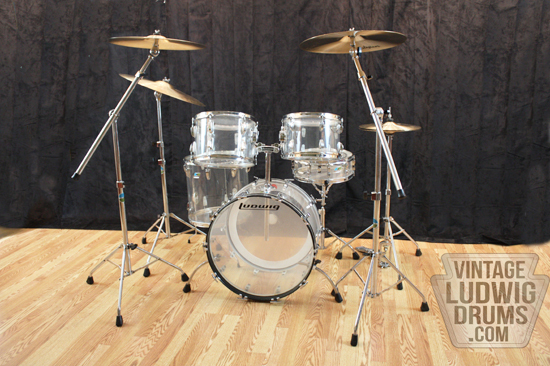 This kit is outfitted with original rail consolette single tom tom holder, extremely rare on Stainless kits. Stainless steel drums are all presence, punch, and tone. They produced a real dry controlled tone with a volume that could not be captured by any wood shell. These are for the real tone junkies out there that love to mix it up, and create a tone unmatched by its "generic" wood counterparts. This Psychedelic Red beauty extraordinary! Everything about this kit is exceptionally rare. It is a Custom ordered configuration, that was never cataloged as an outfit. Most dealers back then would only stock standard outfits that were common to the current catalog. 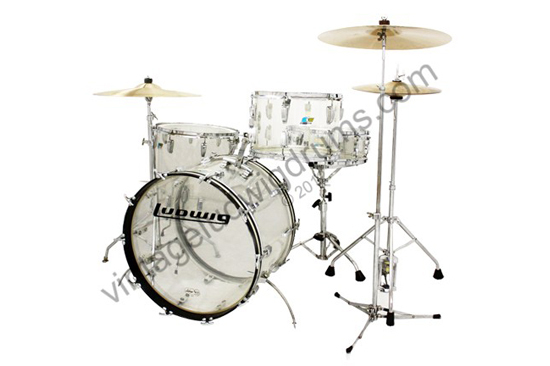 Ludwig did however offer component sizes that one could custom configure a kit from. The amount of people that went that route were very few, and those in first generation Psych Red are even fewer! 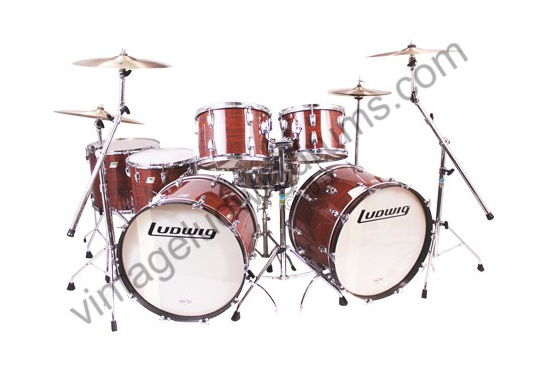 This Ludwig features the later breed of wood shell from Ludwig. Thick 6-ply shells with stellar tone, and massive volume. These always have a way of bringing the rock! All the punch, volume, and attack you'd ever want. It features the unique Black Panther wrap. Extremely rare configuration, custom ordered for one purpose only: bringing down the walls!!!! 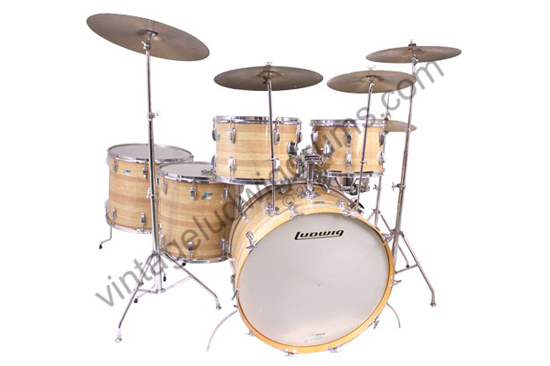 This Ludwig features the later breed of wood shell from Ludwig. Thick 6-ply shells with stellar tone, and massive volume. These always have a way of bringing the rock! All the punch, volume, and attack you'd ever want. It features Walnut cortex wrap. 100% factory original twin virgin 24" bass drums. Go drum fill crazy on this baby! Great 3-ply shells in maple cortex. 100% original, no after market modifications, or repairs. Excellent 70's era Ludwig kit.